Metamorphosis: Chrysalis | Words of Wisdom? 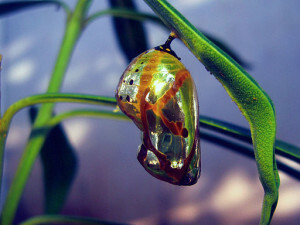 Caterpillars are shape shifters, and the chrysalis phase is when the “magic” happens. It is one of those everyday miracles that occur all around us: somewhere in the midst of that darkness, a comparatively unremarkable creature that crawls becomes a magnificent creature that flies. But, if I pause long enough to consider it, I believe that during these times of reduced motivation and productivity, often the truth is that my energy is merely diverted to doing the work of the soul. I would do well to remember that much of the time there is an invisible-yet-significant reason behind what seems like malaise. There is transformation going on within. There is growth in the works. There is healing taking place. And if I can just relax and let the process occur, instead of persistently urging myself onward, I give myself the gift of support for the conversion my being is ready to achieve. Is it possible that, in an effort to keep pace with your hectic life, you are pushing yourself forward in denial of what your soul needs? Patience with yourself is essential if you expect to achieve the whole benefit of the transformation. You can’t rush the chrysalis phase. Not if you expect to fly. This entry was posted in Metamorphosis and tagged growth, healing, transformation. Bookmark the permalink. Thank you for the beautiful reminder for me to be patient with myself. As a child, I was repeatedly told that daydreaming and inactivity was bad, and meant you are lazy. It is difficult for me to slowwww down sometimes and become introspective. I will remember your words next time I need time for this.